Cape Erimo: what makes braving the winds worthwhile? Cape Erimo is well known in Japan for Shinichi Mori’s enka song Erimo Misaki. 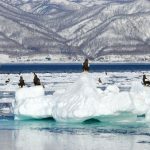 Located at the southernmost tip of the Hidaka mountain range, which is said to be the geological backbone of Hokkaido; the cape is known for its magnificent natural scenery, as well as being famous as a harbor seal habitat. 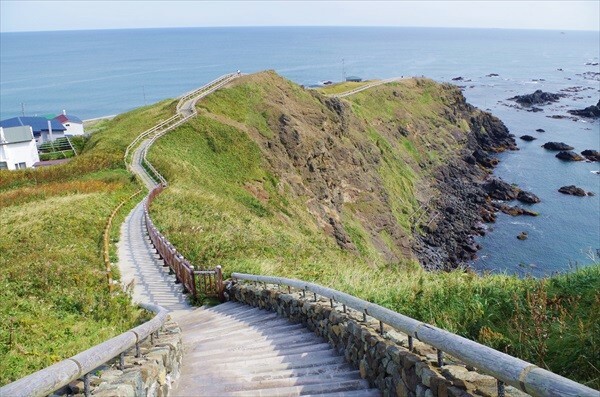 Furthermore, there are sightseeing spots at Cape Erimo such as its white lighthouse and the Wind Museum Kaze no Yakata, in addition to many souvenir shops and restaurants offering fresh sea food. Nature, sightseeing, delicious food and souvenirs; here all the essential components are present that make for a great travel destination. 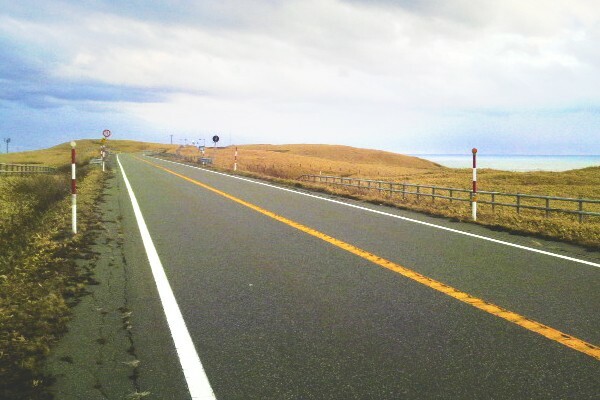 Administratively part of Erimo-cho in Horoizumi-gun, Hokkaido; Cape Erimo is located at the southernmost tip of the Hidaka Range, which is also called the backbone of Hokkaido, and whose mountains are spread out over a distance of 150 Km. Cape Erimo is also famous for the fact that its winds are very strong, and that from spring through summer lots of clouds form, due to the warm Kuroshio Current and the cold Oyashio Current colliding there. Standing about 60 meters tall, with rocky reefs stretching out for 2 Km beyond its tip, the cape commands a view of magnificent natural beauty. 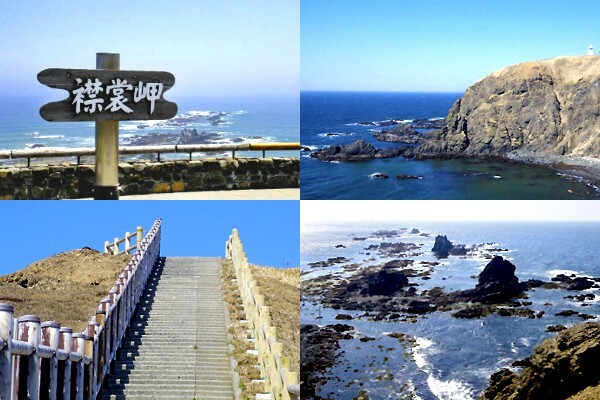 In 2010, it became nationally designated for its scenic beauty as a cultural asset under the name Pirika Noka, meaning “beautiful shape” in the Ainu language. Cape Erimo is also famous as a spot at which to view the first sunrise of the New Year. Every year many people come to behold the sun’s first majestic rays rising from beyond the reef’s rocks. On the morning of New Year’s Day the nearby Wind Museum Kaze no Yakata is open for the occasion too, allowing you to enjoy the sun from its observation room as well. A fun place to experience the winds of Cape Erimo! 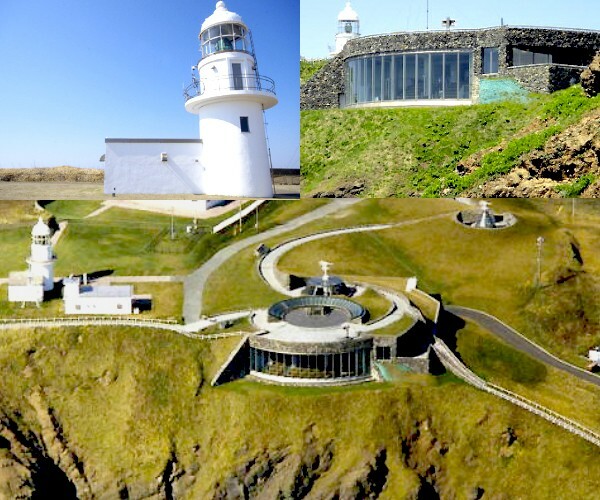 As you can see in the image above, the Wind Museum Kaze no Yakata, located at a spot renowned for its strong winds, was dug into the cape itself, so as not to block any light emanating from the nearby Erimo Light House. From the museum Erimo Cape’s observation deck can be accessed too. 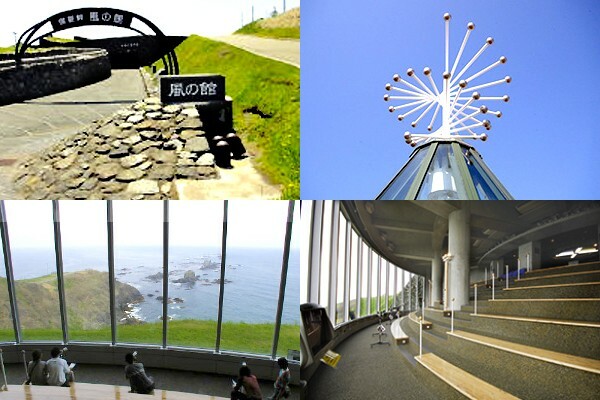 Nearby the observation deck there is a monument dedicated to Erimo Misaki, the enka song with which Shinichi Mori became instantly famous; and there is also a promenade leading from the observation deck to the top of the cape. It’s possible to arrive at the observation deck without passing through the museum, but on days with strong winds it can be more comfortable to make your way to the observation deck while sheltered by the building’s walls. Inside there is also an observation room (the lower half of the image above) where you can enjoy Cape Erimo’s splendid view comfortably as well. 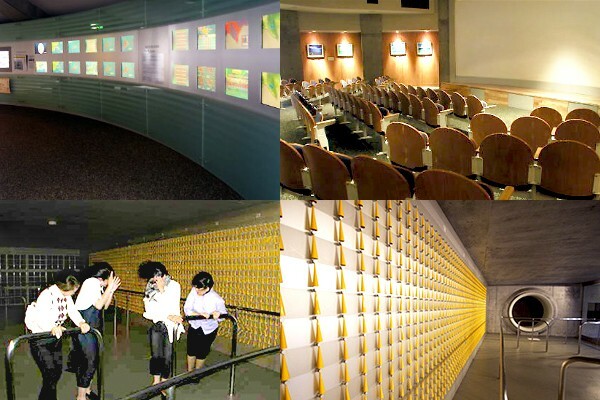 Inside the museum, there are exhibitions related the wind (the upper left of the image above), but there is also a room (the lower half of the image above) in which you can experience 25 m/s winds yourself head-on. You might find it hard to even stand up straight in there! Finally, there is a movie theater (the upper right of the image above), where a documentary called “The cape where seals live” by nature photographer Eiichi Kurasawa is shown, from which you can learn about the lives of the many harbor seals that call Erimo Cape their home – especially if you understand Japanese. 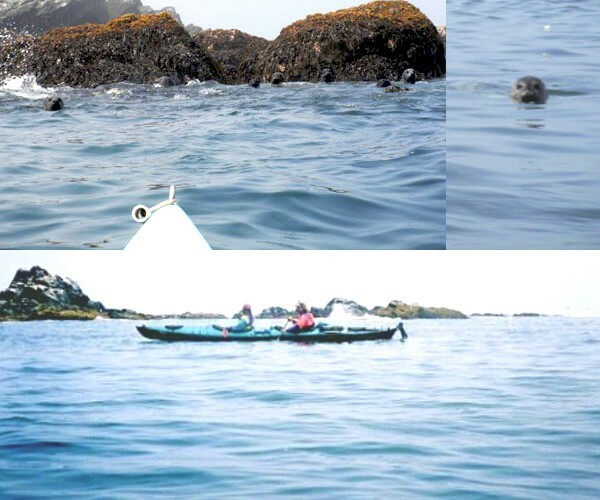 The area around Cape Erimo is famous as a prominent Japanese harbor seal habitat. 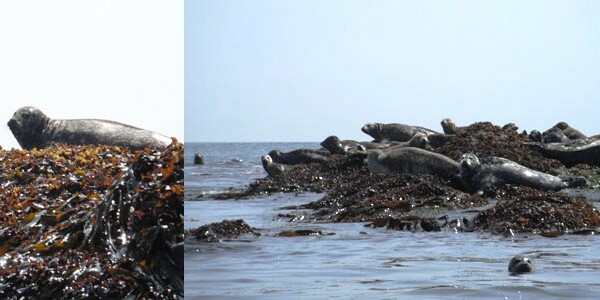 Belonging to the genus Phoca of the Phocidae family of true seals, harbor seals, which are the only species of seal that live along the shores of Japan, don’t give birth on ice, but on rocks; and every year around May and June you can see this child-raising taking place from the cape. 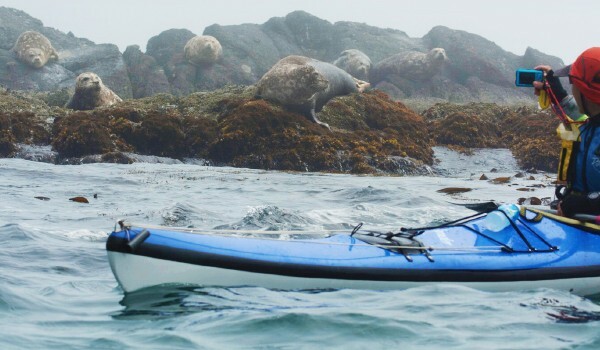 Seals can be viewed with the telescopes in the observation room of the above-mentioned Wind Museum, but for those who want to see the seals up close and experience Cape Erimo’s environs in their full intensity, the seal watching sea kayak tour is an attractive option. Fun tours in which you might encounter scenes such as in the image above are offered in courses of different durations, starting from 2 hours. Even if you have never set foot in a kayak before, you can be assured that a guide will gently provide all the guidance you need. In the 3 hour Tokkari course you can leisurely approach the seal sanctuary, and even take a break amid the rocks. Lunches or snacks and drinks are included, so you can have a great time all-around. 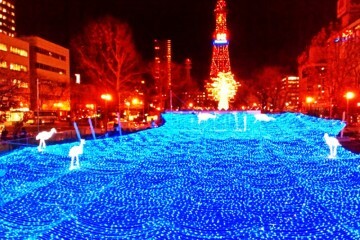 Toyoni Lake, with a circumference of about 1 Km, has recently begun to attract attention as the Heart Lake. 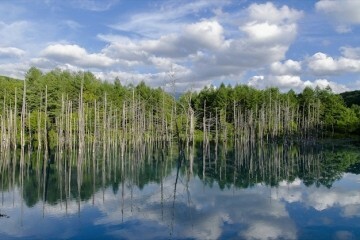 Situated 18 Km north of Cape Erimo, it is the only natural lake in the Hidaka-sanmyaku Erimo Quasi-National Park. The surface of the lake surrounded by virgin forests appears when viewed from above as a twinkling cobalt blue heart in a sea of green. 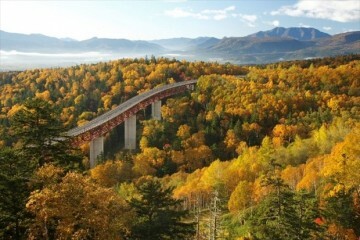 The Golden Road, as the section of National Road 336 leading to the lake is called in apparent reference to its construction costs, is also recommended because of the superb views it offers. Unfortunately, while you can reach the lake, there is as of present no observatory or other sufficiently elevated vantage point from which you can confirm with your own eyes that the lake is indeed shaped like a heart. You can definitely see the lake itself though. Walking through the forest, it is a delight just to suddenly see the idyllic lake open up before your eyes. Getting from the parking area to the lake’s shores requires walking along a forest trail on somewhat difficult terrain, so please watch your step. Also, since 2015 there exists an on-location autumn-only helicopter sightseeing tour from which you can enjoy the sight of Toyoni Lake from above. See here for more information and reservations. This is an establishment where you can enjoy shopping and eating. With a wide-ranging menu, including a raw sea urchin rice bowl, a grilled fish set meal, a set meal with plenty of seasonal sashimi, ramen, and kelp-flavored soft serve ice cream; there is plenty on offer for the whole family to enjoy. This spacious building, at which large tourist buses also top by, has a fish preserve too, and allows you plenty of room to enjoy fresh sea food and browse souvenirs. Even if you buy a lot, they provide a delivery service allowing you to send your marine products to anywhere in Japan. 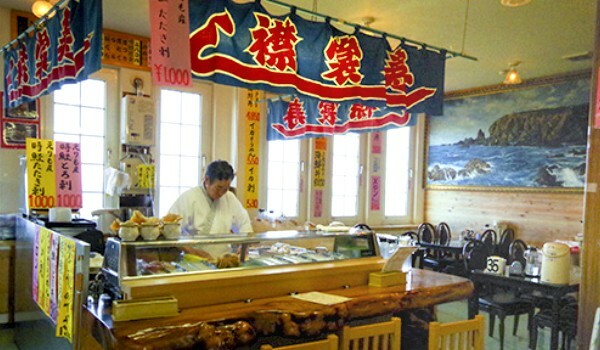 The whelk ramen of dining hall Muteki Shokudo located inside Cape Erimo Rest House has even been featured in the Michelin Guide to Hokkaido. 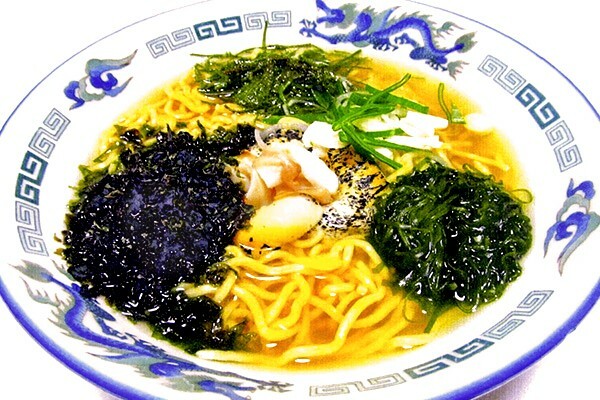 This Erimo Ramen, which can be tasted nowhere else; is a salt-based ramen containing the locally caught whelk (a variety of sea snail), chopped kombu (kelp), hornwort, and dried rock seaweed. People travel great distances to taste it here, so don’t miss out on the chance to try it while you can! Aside from ramen, there is also a fresh sea food rice bowl; and the luxurious ramen and sea urchin rice bowl set is popular too. By the way, Muteki Shokudo is located inside the souvenir shop Shibuta Store of the Cape Erimo Rest House, so once you’re full there is still plenty of opportunity left for shopping. In Erimo town too, there are several places where you can eat all sorts of Hokkaido delicacies. 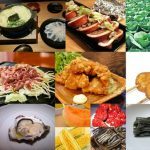 Many of the things one would generally like to taste when visiting Hokkaido are on offer aplenty in the Erimo area, including the districts Erimo-cho, Erimo-Misaki and Erimo-cho-Hon-cho. 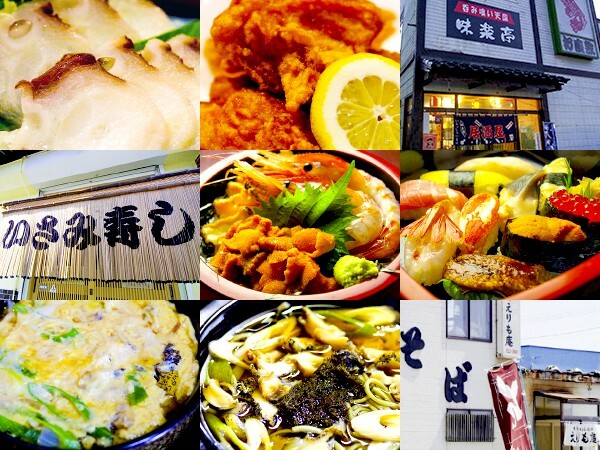 With the Hokkaido specialty fried chicken zangi (top of the image above), sushi and chirashizushi (center), and the Erimo delicacy whelk soba noodles (bottom), this is a great area to go for an in-and-out gourmet stroll. See here for more Cape Erimo gourmet information. Here we will introduce spots along the way to Cape Erimo that you might want to stop by. This section applies to a scenario where you rent a car at New Chitose Airport, and drive it along the following route: New Chitose Airport → Tomakomai → Hidaka → Shin-Hidaka → Cape Erimo. If that is the case, you should definitely check out the information below. 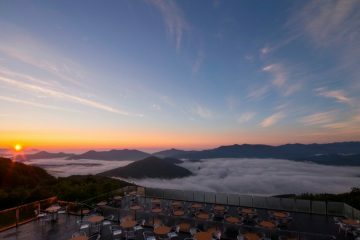 Just 15 minutes by car from New Chitose Airport, this a recommended stopover in the Tomakomai area. Lake Utonai (upper left) is one of the few migratory bird waypoints in Japan, and is known as Japan’s first bird sanctuary. Sightings of approximately 270 species of wild bird have been confirmed, including a large variety of geese, ducks and swans. 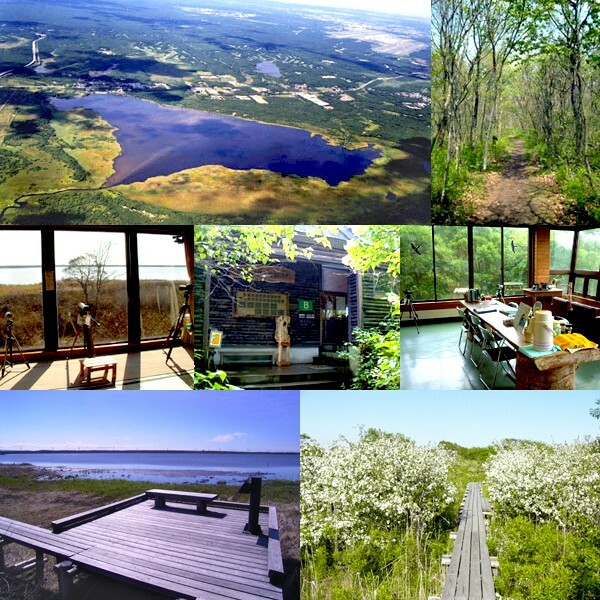 Featuring a lakeside nature center (center of the image above) which includes an observation room (center left) with an unbroken view of the lake, and a relaxation area (center right); and outside a Northern Fox Path (top right), and several board walks (bottom); this is a great spot to observe a wealth of birds and nature any time of the year. This a recommended stopover in the heart of the Hidaka horse breeding region. One of Japan’s foremost rural racecourse in scale, Monbetsu Racecourse is popular among adults and children alike, as the close distance between spectators and paddocks ensures a very engaging live experience watching the horses race. Among the spacious grounds are included a lawn with picnic tables, small log houses providing relaxation for families and couples, a cafe and shop selling popular local sweets, a Genghis Khan House where you can enjoy this Hokkaido specialty barbecue below the blue skies to your heart’s content (reservation required), and places where you can watch the sprinting horses while enjoying beer and food; in other words, this is a racecourse offering amusement for all. 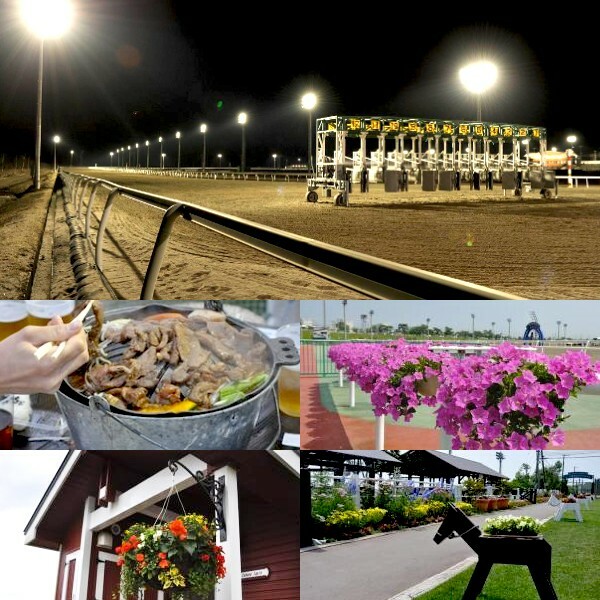 Night time races are held too, and the litten up racecourse creates a very romantic atmosphere. There even is a free shuttle bus service from and to Sapporo on the days that races are held, so you can drink and stay late with peace of mind. On race days there is a free shuttle bus from Sapporo. To find out the opening days and hours, please check the race and event calendar on the Horse Racing Hokkaido Homepage. This a must-see if you’re visiting the area during Hokkaido’s cherry blossom season. Did you know that Japan’s largest scale row of cherry blossom trees, which is selected as one of Japan’s 100 most famous cherry blossom locations, as well as one of Japan’s 100 best road side tree views, and is recognized since 2004 as a Hokkaido heritage site; is located in Shin-hidaka in the Hidaka Subprefecture? The Shizunai Nijukken Road Cherry Blossom Trees total about 3000 cherry blossom trees on both sides of the straight road through the town of Shizunai, continuing for approximately 7 Km from Tahara to Misono; offering a superb blossom scenery unlike anywhere else. 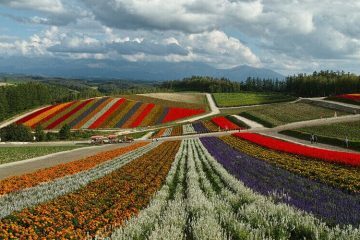 Every year Hokkaido’s blossoming season tends to peak around Golden Week (Apr 29 to early May). 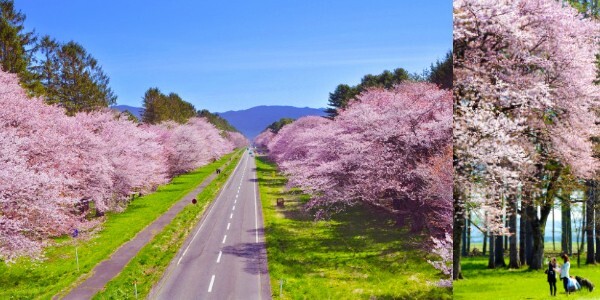 Even outside of the cherry blossom season driving along this road can be recommended as a variety of farmland and fresh green colors make this a pleasant ride. It is also possible to take a train to Samani Station and then transfer onto a bus from there. With the fun it is to get to there, and all the fun that still awaits you once you do, surely Cape Erimo is a great sightseeing destination? 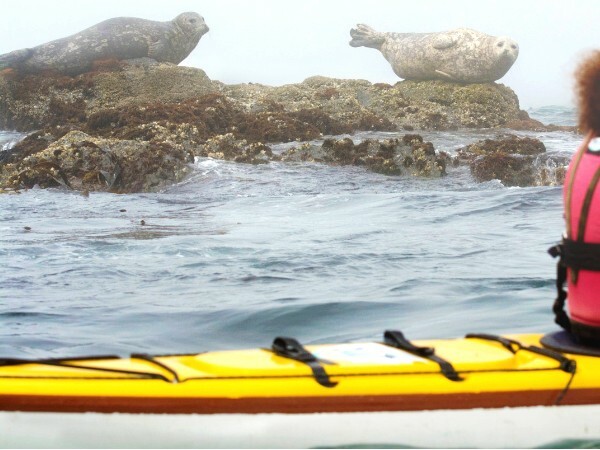 Enjoy beautiful sceneries to your heart’s content, eat delicious fresh food, and experience activities rarely possible elsewhere such as sea kayaking among seals and precipitous cliffs; this destination is bound to get you excited before you’ve even finished planning your trip. Only Available This Summer! 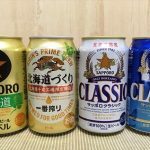 Enjoy Limited Edition Hokkaido Beer When You Travel to Hokkaido! 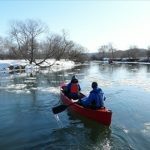 Kushiro Marsh in winter: observe Japan’s famous cranes from a canoe!